It’s one room in the house that can often be neglected when it comes to decorating and decor. It’s not always cheap to change or update a bathroom, but if you have a white or neutral suite you should be able to update the look by changing accessories and colour to reflect the new trends. 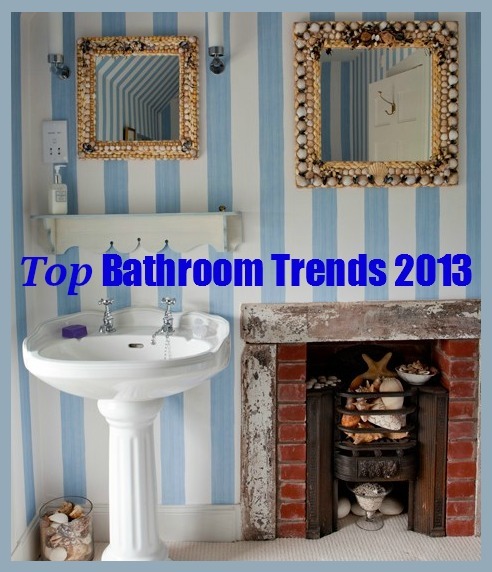 I’ve been doing a little research and looking at bathroom trends for 2013 and have brought my favourite 3 to showcase on the blog today. The rural look or rustic living feel doesn’t have to be contained in the main living areas of the home, it can work just as well in a bathroom. In this image from House to Home magazine you can see where a beautiful outdoor trees wallpaper has been used on the bathroom wall. There’s no reason why you can’t use wallpaper in the bathroom as long as you have good ventilation. You’ll also need a perspex splashback which you can get from all good diy stores like B&Q which then protects the wallpaper from getting wet. 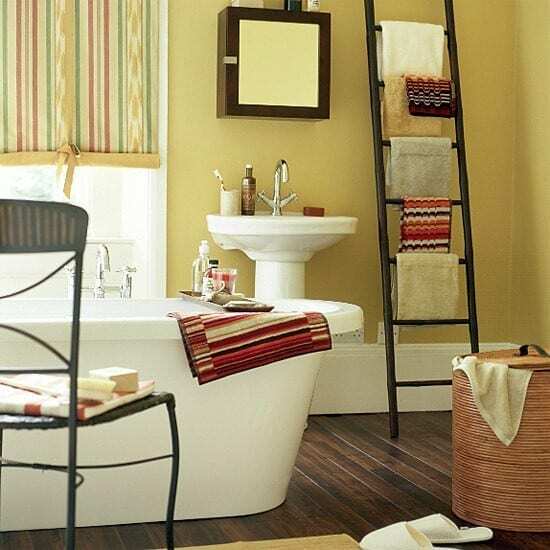 You could enhance this look with lots of wooden accessories, a wooden bathmat perhaps and rustic patterned towels. The Oriental look works wonderfully in a bathroom with the soft greens and bamboo shades lending themselves particularly well to this space in the home. There’s plenty of choice too for accessories when you’re pulling looks like this together. Shops like John Lewis and Next have a great selection when it comes to bathroom extras. The rich wood floor in this room compliments the warmth in the striped towels and towel ladder and works well with the soft wall colour. The Coastal look is always a popular one and it’s still strong this season. I love this rustic update on the look ensuring it doesn’t look too cheesy. 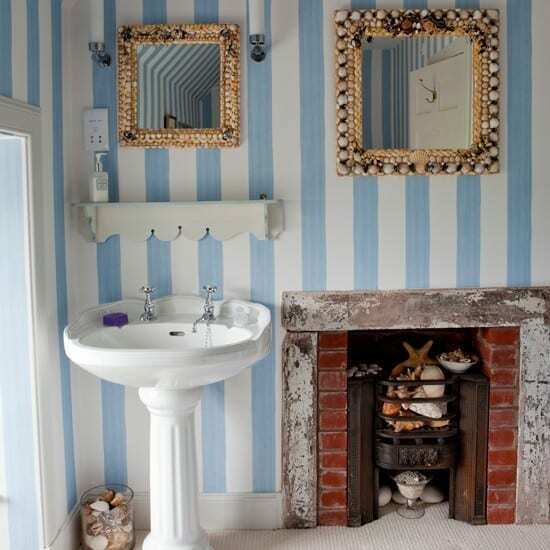 The stripes look like they’re painted on; an easy technique to achieve, and the addition of what looks like upcycled shell mirrors is a great one. It doesn’t look like a large room so the mirrors give the illusion of space whilst the stripes elongate the room. You don’t always have to add boats and ships to give your home that coastal feel. Next Post Style Chat: Would you Live the Rural Life?